He has helped me with this genealogy. I have listened and gone over and over the facts with him. I gathered these notes for my sons, Dennis, Timmy, Sean and Mickey and my grandchildren but would also like to share the notes with the Kerry group. I hope it will benefit someone out there searching. As Mary, (Waterlilys@aol.com) our IRL-KERRY mailing listowner and host of Kerry site, always mentions, SHARE YOUR STUFF. (this should be pretty accurate as my dad has a great memory but we all know that with the passing of time, there can make mistakes.) My dad and I sit down everyday and have chats about Ireland and his friends. I am blessed. I am making my notes available to coincide with the recent posting of the Killarney Register of Electors of 1926. These notes are about some of the families on that list. Peter also worked in the final building and erection of steeple at St Mary's Cathedral in Killarney abt 1912. He also worked on the telegraph lines with a Mr CRANITCH. 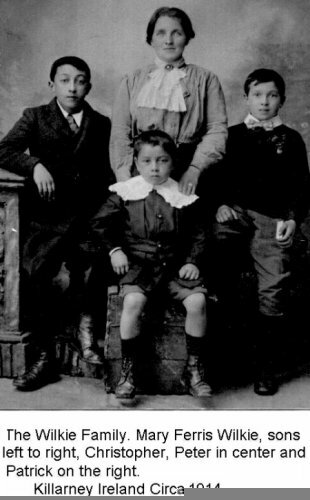 Peter immigrated and lived in Bronx, NY with son Christopher until his death in 1947. 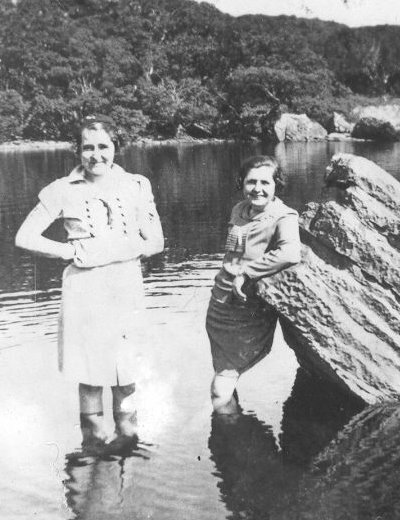 Mary FERRIS b Castlegregory grandmother (Old Killarney photo. click thumbnail to see larger image) lived (Green Ln) and worked in a cooperative store during WW I. The store was owned by a gent (?name) from Rathmore. farmers brought their dairy products and meat to this store. The English purchased it and shipped it by rail out of Killarney for the soldiers in the war. Mary passed away 1925 and is buried New Cemetary, Killarney. Children of Peter and Mary WILKIE were Christopher, Patrick, Peter (shown right) and sisters Bridie, Hannah, Margaret and Mariah WILKIE. Patrick KEOGH was another fellow from Killarney pop knew that lived in New York. He married a HORAN girl from Killarney. In pops prayer book is a rememberance card with the date of his passing 5 Oct 1958 (R.I.P.) Patricks brother in Killarney was John KEOGH and he was a doorman for many years at the International Hotel in Killarney. The youngest brother ? Keogh went and lived in Canada. The O'KELLY'S had a store on Henn St. They had twin girls who both wore their hair real long. Their mother was Biddy O KELLY. Mrs O'RIORDAN had a shop on High St next door to the Market Cross. She sold sweets and decorated her window at Christmas with sweets and toys. All the kids in town loved her store. Jerry HAYES (High St) owned a fleet of carriages and side cars. Dad remembers he had a daughter name O'SULLIVAN (my dad didn't know why the name was different) the daughter first immigrated to Australia and from there she went to NYC. The PIGOTT family (Brasby Ln) worked for the town of Killarney. Kept the town nice and tidy. There was an O SULLIVAN family from High St that once ran a hotel. The hotel was opposite Denis Counihans place but sadly, the hotel burned down. One of their sons, Joe O SULLIVAN was a policeman in London. Brother Michael James O'SULLIVAN immigrated to New York City and it is remembered that there were 2 other brothers Walter and Leonard. 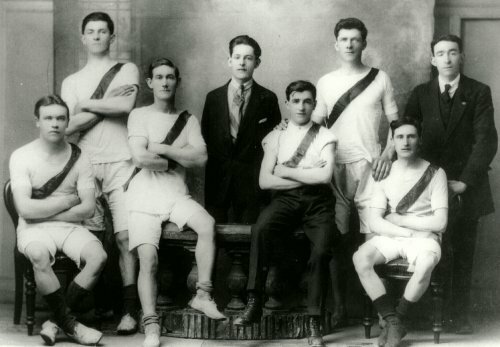 Bill DOODY (St Mary's Court, uncle to Willie Mulcahy) and Thade Hayes were the local runners. Would race and practice out in the country side. There was a HARRINGTON gent from St Mary's Terrace that immigrated to Australia. The MAHONEY family from Ducketts Lane had a daughter Katie MAHONEY, also another sister (? name) and a brother John MAHONEY. Katie married a Swedish man and lived in New York City on 50th St between 7th and 8th Ave (c1950) but in later years moved to upstate New York and my dad never heard from them again. Nel MURPHY from High St, after immigrating, ran a boarding house at 162 East 97th St in New York City for Killarney immigrants. She married Tom CALAHAN (High St) The Murphy family (High St) were Thomas, Jerry, Dan and sisters Irene and Helen. Nels boarding house NYC was a great meeting place for the Killarney immigrants in the 1920's. Nel's brother inlaw was Tim CALAHAN (High St) who worked on tug boats in NYC. Later he became a NY City policeman and was stationed mostly around 42nd St. He had a son who became a state trooper in Connecticut. Jackie HORGAN, (Ducketts Ln married Bessie EAGER) he worked on a ship called the Mini Carta. It is believed it's home port was Tilberry at the Royal Victoria Docks. 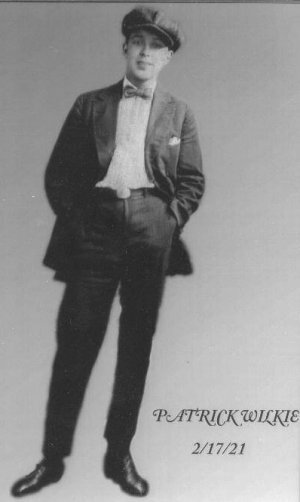 Willie HORGAN lived New St-2nd house next to Presentation Convent and later became a house painter in US and was employed by the College of Notre Dame in Indiana and lived right at the college. Dad remembers what a beautiful voice he had. Willie had a brother Morris. A cute story about Willie was the day pop and he met again when they both arrived back in Killarney on the same day (1954). Pop got there first and was at a local pub with the boys chatting about old times when a taxi pulled up outside. Willie got out and got down on his knees and kissed the ground. He was so happy to be home. The MCEVOYS lived on New St and had a daughter that sang and also played the violin.The neighbors would sit by their windows and listen to her play. Dad said this girl was about 2 yrs older than him. The LEHANES on New St supplied the local boys with bamboo from a tree in their yard. Fishing poles were made from them. Mr Lehanes (dad not sure of the correct spelling of this name) was an inspector of Munster schools. There was a LEARY on Main St Killarney had a public houe (pub) Does not remember first name.C 1920. Note: In a book I have about Killarney it mentions a singing pub called "The Laurels" that was owned by a Thado LEARY and son Con in the late 1920's. It also mentioned a 2 story pub know as "The Well" owned by Dan O LEARY. There was a Mick LEARY had a public house (pub) on College St about 1920. Billy HORAN SR was a blacksmith on High St and lived on Ball Alley Ln. He had sons Billy HORAN JR and Jimmy HORAN who both came to US. Jimmy went back home again. A picture of Billy Sr is in my Killarney photo of the Ball Alley Fife and Drum Band. 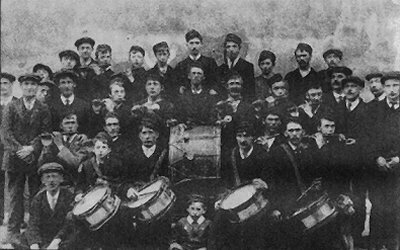 (click thumbnail to see larger image) Top Row, 4th from right is James SULLIVAN and directly below him is Billy HORAN Sr. There was another blacksmith on High St named Paddy SHEA. His shop was next to Spillanes Pub and across the street from Counihans. Paddy Shea was also a politician. The MCCARTHY family on High Street run a Fly Shop. Sold bait and tackle to the local fishermen. Dad thinks the fathers name was Jack, and he made the flys. He remembers the grandfather came from Cork and always wore a sailors cap, and had a beard. Their store was located right next door to Louis ANTHONY'S photo shop. The MCCARTHYS had several children and Timmy & Calley MCCARTHY were the names of 2 of their children. Calley run a fishing boat for the tourists. In those days the tourists wold take a side car trip to the Gap and a boat trip home or vice a versa. The local hotels provided picnic baskets to their guests filled with crackers, cheese and sandwiches. The fishing boats were parked in a canal behind Ross Castle. At Ross Castle, the O ROURKE family were caretakers. Morris MCCARTHY (New St later his home became Police Barracks) He is remembered as a great barrister and orator. Towns people would go to Courthouse to hear him speak. Michael HEALY High St. His father (?) drove a grocery truck for the GUERIN's on High St. The Guerin family had twin boys. The mayor of Killarney same period of time 1915-21 was a Jermiah LEARY (Main St). He had a nickname Big Jer. He had a shop and sold meat and groceries. His son became mayor later on too. Pop forgot son's first name The son worked at the county home and my dad remembers when he and my mom Alice FORHANE- (upper left in photo at right. click thumbnail to see larger image) took a trip back in the 50's, the son was the Leary who gave them all their birth certificates. An EGAN family had a hotel on (Main St) before 1921. In 1954, pops first trip back, the hotel had new owners but while he was taking a tour of the Ring of Kerry, he met this family again at a little tea house on the ring, he's not sure of the location only that it was on the right, as you come over a little bridge and there was a house opposite it on the left that belonged to a family of MAHONEY'S (he pronouces it Mah-hoe-nee's) the Mahoneys had a son John who immigrated to NYC. James MAHONEY(New St) left Killarney early in the 1900's. He was a Customs Inspector of baggage at the docks in NYC , lived up in Parkchester district in Bronx and had a son that became a priest who taught at Fordham University in NYC and later became a Bishop. Another brother John MAHONEY was a New York City fireman and was stationed at a fire station around the 70's or 80's th St, (West Side). Brother Patrick MAHONEY remained in Killarney, married an OLEARY girl. Patricks wife had a brother OLEARY in New York that was a detective for the NYC Police Department. Their mother Mrs MAHONEY ran a butcher shop on New Street in Killarney. The John M REIDY store (Main St) sold tea, sugar, bread and had a store adjacent to it that sold flour and meal to the farmers on Saturday when they all came to town. When the Reidy's passed away they left their store to a clerk MISS OATES, (she lived over store) and was a great friend of grandmother Mary Ferris Wilkie. Miss Oates married and had a daughter in US that graduated from nursing school in Pennsylvania. Patrick WILKIE- (Green Lane) lived in US at NYC Yorkville neighborhood, 87th and York Ave. In 1922 he joined the US Marines and was stationed in Haiti. After service he married Alice FORHANE of Killarney, worked 32 yrs and retired from the New York Cornell Medical Center in NYC. His only son Robert WILKIE served 26 years in the US Navy and retired as a Lt Commander. Patrick and Alice had 3 daughters Patricia, Alice and Bridget. Pop also knew an Mickey O'LEARY (lived near Henn St) and in the States (NYC) worked as a supervisor of the streetcars at 149th St. He said when he became real ill he went back to Killarney to spend the last days of his life. Pop remembers meeting a Killarney man in New Jersey back in the 30's, he was a LOONEY from Killarney. He was a brother to Norah LOONEY. Norah was a friend to my aunts Bridie, Hannah and Margaret WILKIE. The three Wilkie girls worked as maids for wealthy families in and around New York City. Norah LOONEY, is still living (1999) at a retirement home in KERRY. Her son is a priest in Kilcummin. We visted her and a gent named Willie LITTLEWOOD from Beaufort in our 97 trip. Mr Littlewood mother was married to Alice Forhane aunt, (?) HARTNETT. Cecilia FORHANE and Joe FORHANE lived with him for several years after grandmother Julia HARTNETT d 1915, (buried cemetary at Muckross Abbey). This Hartnett family were from the Gap of Dunloe area. Grandmother Julia was only 43 when she died, left 10 children, Mary, Lucy, Alice, Norah, Pauline, Cecilia, Paddy, Christy, Michael, and Joseph FORHANE. The two youngest children were first placed in the county home. Later they went to live with Willie LITTLEWOOD (d 1997). Willie was a fisherman. He fished for salmon on the Lakes and sold his catch to the local hotels. Louise HARTNETT married CONNELL had a son George CONNELL lived at one time 132nd St New York City. Nora HARTNETT married a Donoghue and lived at one time 3rd Ave and 83rd St NYC c late 1920 Dad remembers they had a son and a daughter. One of the Hartnett sisters married a PUGH- he lived and worked for an electric light company in Dublin. 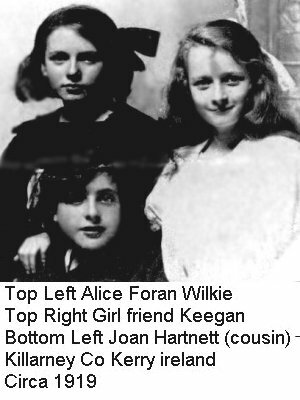 One of the Hartnett sisters married Denis CRONIN in Killarney. This Hartnett sister was a midwife. Patrick HARTNETT father of Donie HARTNETT of Beaufort (Killarney) lived out near the Gap, near Kate Kearneys Cottage, the Hartnetts lived next door to Annie COFFEY. Then as you continue out towards the Gap, over the bridge is where Willie Littlewood lived. Continue on and you come to Annie SULLIVAN'S place, a bread and breakfast back in the early early 1900's. Mrs Sullivan cottage at the edge of the mountain was decorated inside with photos of famous people who stayed there. Dad remembers a picture of Charlie Chaplain. The Hartnett's who immigrated from this Hartnett family settled in the White Plains area of New York. Tommy HARTNETT was an attendant for the court in White Plains NY. MCCARTHY from Ducketts Lane lost his life from a fall while erecting the steeple at St Mary's Church about 1913. (R.I.P) In booklet "Killarney Cathedral", Irish Heritage Series # 66, there is a picture of a group of Cathedral workers. Pop remembers on pay day all the kids would go down to meet their fathers at the Church and their dads treated them to candy. I asked pop about an Irish Wake. He said the body was prepared by women and laid out in the house. He said the tobacco pipes came out and there was drinks in the back of house. The night before burial the body was placed into a coffin (LEAHY'S*, New Street made the coffins) and taken to the Church and left there overnight. After the funeral mass the body was put into a buck board drawn by horse and taken to the cemetery at Muckross Abbey. As the wagon passed by the shops in the town, window shades were drawn and people stepped inside the shops to show their respect. *Mr Leahy had a daughter Daisy LEAHY who attended the Lorreto convent and then became a nurse. Many of the towns young people worked for the Royal Post Office during WWI. They would ride bikes around town and out in the country delivering telegrams mostly of injury or death in the war. The young teenagers wore a blue uniform with a red stripe on it and a round blue cap. Alice FORHANE (Tuohill Ln, later moved to Sunny Hill) worked for the post office along with her brother Patrick FORHANE (see Rowing Team right, and note end of paragraph. click thumbnail to see larger image), sister Norah FORHANE and my dad remembers a Dora McCARTHY from the Market Lane who worked there (later she moved to the cottages up on Sunny Hill) another fellow named Neily JOHNSON from New Street & Bill DOODY worked for the Post Office at night and Doody was also a local marathon runner. Tom CAREY of High St worked at the Post office as a young man and was still there in the 50's. *NOTE: The Killarney Rowing Team photo c 1920 identifies M. MAHONEY,T. RYAN, P. ROBERTS, S. MORIARTY, P. LEARY, Patrick FORHANE, M. MCGILLYCUDDY AND M. MURPHY. 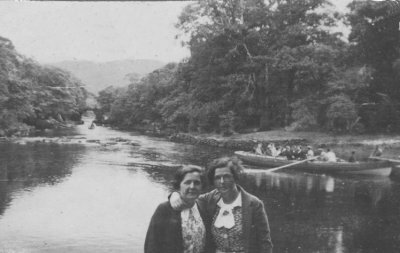 This photo was given to cousin Donald Forhane (father Patrick Forhane) on a trip to Killarney by one of Killarneys town historians. Dad said there was a bike shop in town (New Street) run by the THOMPSON family. He remembers Mrs. THOMPSON (yes Mrs) loved to play golf at the old golf links where he was a caddy. She was usually accompanied by a friend named Babs SCANLON (lived top of New Street). The old golf links, back of where McDonalds is located today, were run by Hugh O'FLAGHERTY parents. The family lived at a lodge on the golf course. The golf pro at that time was Tommy CRAWFORD and he lived in a lodge near the entrance to the golf course. Hugh later went on to be a priest, was made a Monseignor and spent time at the Vatican in the1940's. It was during this period of time that Msgr. Flagherty became famous for saving thousands of Jews from certain death by hiding them. A movie the "Scartlet and The Black" was made about his heroics. Msgr. Hugh was played by actor Gregory Peck. The movie version was from a book, "The Scarlet Pimpernel of the Vatican". Pop remembers the days when he and Hugh played a little golf together as young men. Hugh's family later lived on Henn St. Coincidently, my youngest son Mickey while working as a bellman at the Williamsburg Inn in Virigina, met Msgr Flagherty's nephew, Judge Hugh O'Flagherty, Justice of the Supreme Court, Ireland. They had a great chat when Mickey told him his grandfather was from Killarney. There were other caddies at the old golf course, brothers Pat & Tigo COFFEY of Ball Alley Ln, Tommy MCKENNA of High St, Sylvester CASEY of High St, Willie MULCAHY of St Mary's Ter, Jimmy HORAN of Ball Alley Ln and pop, Paddy Joe WILKIE of the Green Ln. Many of Killarney young men signed up and went away in the first World War. The British launched a big recruiting campaign. The recruits trained at Ballybunion in Tralee then stationed at Fermoy in Cork. My grandfather Peter Wilkie was a piper with the Irish Munster Fusiliers. 2nd Battalion He was injured by gas in a battle in France. My dad remembers an article was written about this and pictures of his family taken by a local newspaper but we have never been able to locate article. I understand I have to go to Dublin to view old newspapers, probably the Irish Echo which stopped printing in 1922. (Next trip, God willing) We have narrowed the date of article to year 1915 to May of 1916. If anyone comes across this info before I do, let me know - Bridget Smith. Mr James Sullivan (RMF) was so kind to send me this info from a news article and it lists the commanding officer and company of Royal Munsters in France that period of time. "The presentation of bagpipes struck a chord, the person was John Redmond M.P. a member of Parliament in the Home Rule Party, he died 1918. "Mr. John REDMOND AND The MUNSTER FUSILIERS. 3rd Brigade, 1st Div. B.E.F. J.W.Considine. Maj. Commanding 2nd R.M.F. From the Kerry evening Post, 28 Jul 1915." Note, in a book I read about the RMF, Maj Cosidine (a Glasgow Irishman) was shot in the Battle of Loos, France 25 Sept 1915. Here are some names my dad remembers of men from Killarney Who Served in WW I in the English Army, Irish Regiments. This is good information as the Public Records Office in England will probably have info on them. OBrien (St Mary's Terrace) lost both legs below his knees in WW I. Pop said this young man, before the War, was one of the town's best swimmers. He was saddened to see him when he came home in a wheel chair. Many of the men went to Wales to work in the ammunitions plant at Cardiff. Pop said you always knew who went to England to work as they all came back to Killarney sporting trench coats, some came back with English brides. "The death occurred recently of 102-year-old Killarney man, Paddy Joe Wilkie, who had lived in the US since 1921. Despite his years, Paddy Joe had returned to Ireland as recently as two years ago and visited Killarney and Dublin.
" He had thoroughly enjoyed the visit, talking to old friends, catching up with relatives and reminiscing with his neighbours.
" Born in Killarney in 1903, Paddy Joe had two brothers and three sisters, all of whom emigrated to New York at various stages in the early twenties.
" As he headed off to New York in 1921, Paddy Joe left behind his childhood sweetheart, Alice Forhane. But five years later Alice also emigrated to New York and the couple later married.
" Paddy Joe joined the US Marine Corps in 1922 and served in Haiti, Norfolk, Newport and Brooklyn. He worked as a security guard in New York's Cornell Medical Centre after leaving the service until his retirement in 1965. Paddy Joe moved to Vero Beach in Florida where he had been residing since. The Killarney man will be sadly missed by his family and many friends in New York, Florida and Killarney."